Over the centuries, the art of making incense faded and with industrialisation, became just incense - another mass produced roughly made item with inferior ingredients, devoid of any spiritual meaning. When Mother's Fragrances were created they wanted to revive the ancient art and try to return to a pure, beautiful and spiritual product. They re-discovered the masaia method. This method of creating incense mixes all the ingredients together in a paste, which is then hand rolled into cones or incense sticks. It allows the use of a large variety of ingredients: resins, wood powders, herbs, precious essential oils and ﬂoral essences, and avoids the use of chemicals. It creates a light, clean burning incense that creates a minimum of ash and slowly spreads smoke, and a gentle aroma. Enjoy the difference! Fairtrade: The Mother's Fragrances make a happy change from conventional practices. they are deeply committed to the wellbeing and prosperity of the people who make the incense, and the project employs nearly 400 people, mainly women, who have a very good job. They enjoy decent working hours good working conditions and pleasant and spacious work environments. Their wages are above minimum wage and far higher than the industry's average, and they benefit from savings scheme, medical insurance and a bicycle scheme. 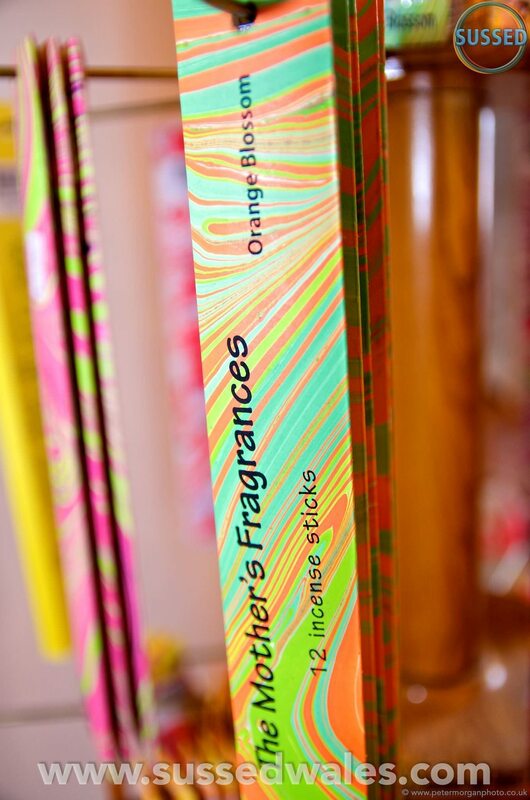 High quality incense from The Mother’s Fragrances. Amber: Delightfully soft and sweet. A dreamy fragrance, it is calming and pleasant. Use its soothing warmth to relax. Autumn Leaves: A rich active, adventurous and inspiring fragrance. Cinnamon and Spice: The warm and happy fragrance of cinnamon with a wealth of spices. Evening Rose: Clear, strong, warm and a little sweet. A wonderful fragrance for the evening. Frankincense: The fragrance of biblical renown, a pleasantly sweet and slightly herbal fragrance. Gardenia: The rich fragrance of the gardenia ﬂowed. Honeysuckle: An active, sweet scent, a little stronger than our other ﬂoral fragrances. Jasmine: Soft and mild. This fragrance is a little dry and green. Jasmine is a scent of purity, it is pleasant and soothing. Lavender: One of our mildest fragrances, dry and fresh with a calming effect. Use Lavender to relax. Lotus: A wonderfully pleasant and sweet fragrance. Lotus is inspiring and makes you feel happy. initiates activity, which can help you to wake up in the morning, to study and work. Myrrh: Active, happy and adventurous. Orange Blossom: A special, slightly heavier ﬂowed fragrance. A dreamy scent for the evening. Opium: Exotic and romantic. Ideal for a relaxing evening in. Passion Flower: mild, but inspiring and creative. Patchouli: The fragrance of the '60‘s: the strong and unmistakable scent of patchouli leaves, softened with a hint of rose and enriched with a variety of herbs. Rose: The fragrance of red roses with a touch of mint. Delightful, clear, friendly and romantic. Roses and Violets: a happy,sunny fragrance. A favourite of children. Splcewood: clearing and cleansing, a natural mosquito repellent, it is ideal for use outside. Vanilla: The sweetness of vanilla and heliotrope makes this our sweetest fragrance. Complete, full and happy. Wild Flowers: The most woody of our ﬂoral fragrances. Warm, rich and relaxing.